WASHINGTON (CNN) -- The U.S. Postal Service will be cutting more than 3,000 jobs and offering nearly a quarter of its work force early retirement as part of its efforts to streamline operations amid the worsening economy, the agency said Friday. 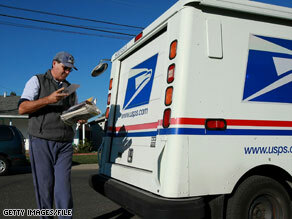 The Postal Service said work force cutbacks will save the agency $100 million annually. Among the job cuts are 1,400 district administrative staff positions and another 1,400 mail processing and management jobs nationwide. More than 500 employees will be out of a job with the closure of six district offices that house only administrative functions, the agency said. The cuts will save the post office about $100 million annually, the agency said. The post office ended its first quarter -- October 1 through December 31 -- with a net loss of $384 million caused by a drop in mail volume of 5.2 billion pieces. The 9.3 percent drop was the eighth consecutive quarter of volume declines, the agency said. In late January, Postmaster General John E. Potter warned Congress that service cuts may be necessary, telling a Senate subcommittee that the agency may be forced to cut mail delivery from six to five days a week. Such a change would have to come from Congress, which mandated the six-day schedule in 1983. "We believe that legislative relief is necessary to preserve the nation's mail system," he told the committee. With no congressional relief on the horizon, Potter announced plans in February to cut $5.9 billion in costs through fiscal year 2010, including eliminating 100 million work hours this year. The agency cut nearly 27 million work hours during the first quarter last year. The agency also froze salaries of all officers and executives at 2008 levels, reduced travel budgets and stopped construction on new postal facilities. The early retirement offer for 150,000 of the postal service's 646,000 employees will be the second round of such offers, agency spokeswoman Sue Brennan said. About 9,000 employees took advantage of the first round about three months ago, she said. Additionally, 162,000 employees are now eligible for regular retirement. CNN's Emily Anderson contributed to this report.